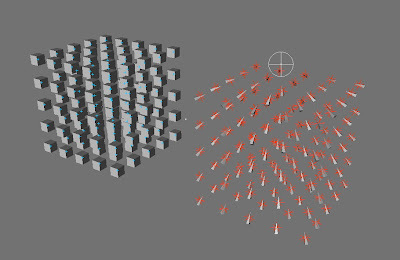 A question was raised on fxphd about the different ways to generate geometry for Thinking Particles if you have created them using the MoGraph Matrix object. You can do it several ways. You can create a Particle Geometry Object then create the particle geometry using Xpresso and the PShape node. Alternatively you can use the Cloner Object and clone onto the Matrix Object. I’ve created a couple of simple scenes that illustrate this. I’ve used two particle groups and then a simple Xpresso setup for each. The first scales one group of particles down and and the other aligns the second group to a null object. The final scene is an example of doing this using only MoGraph, so no Thinking Particles or Xpresso is used. Here’s a link to the files. Here is the thing. I have 300$ to spend on on-line trainings. Since Hypa and TimC are high ranked in my book and Tim is a tutor on several sites, I don’t know which training to purchase? FXphd or Cineversity? There was also a AE training on Fxphd, but it is not available on this term. I would be interested to purchase Fxphd package with both Tim’s courses or on DVD. So Tim, what do you suggest? BTW, I am C4D and AE user. Thank you for your answers and bye. I worked a lot on your file example, PVolumePosition and PPositionFollow 08.04.2004. I don’t understand how to reduce the settlement of the particles. I tried to change every single value, every single parameter, spring speed too, but i failed. I’m not sure what you mean by the settlement of the particles. Do you want the particles to settle, or do you want them to keep moving? Hi Tim very helpful scene file. I’ve been playing around with TParticles for a while. And I have been told to build something like that shown in this site http://www.thankyou.dk. Moderna video, with white cubes. Sorry to posting this link in your blog. I have done something similar using Mograph, I can send you the file to a look at it. I am not good at scripting at all. But, I want to know how possible is to build this with XPRESSO or COFFEE script. Hi Tim, there is a problem i am trying to solve without any success so far. I’m hoping you can help me 🙂 I’m trying to create a setup so that i have a cloud of TP taking the shape of a logo. Then i would like that first shape to morph(?) into a second shape and finally morph(?) back into the first shape. Would you be able to help me with my predicament? You can do this with TP by using the PVolumePosition nodes and moving the particles into a new group for each new volume. However it is simpler to achieve with MoGraph. With MoGraph you can use the Matrix object to clone onto objects and then use the Inheritance Effector to Motion Morph between the the different Matrix Objects. I actually cover this exact technique in Making It Look Great 7 and also in the new Dynamics training. I gave you a solution using MoGraph in the previous post! With MoGraph you can use the Matrix object to clone onto objects and then use the Inheritance Effector to Motion Morph between the the different Matrix Objects. Thanks a lot for your help tim 🙂 I’ll give it a whirl.